Not only do the eavestrough, soffit and fascia complete the final appearance of your home, they each play an pivotal role in protecting the underlying structure. While your eavestrough system is essential for creating proper drainage away from the foundation of your home, your soffits are vital for creating positive airflow through the attic space. Finally your fascia provides necessary protection to the wood fascia underneath. This achieves a visually appealing transition from your roof decking to your soffit. Available in either 5" or 6" our aluminum eavestrough is made on site to ensure it fits perfectly every time. For maintenance free systems we offer Alurex Guttargaurd which is both structural and protects your troughs from leaves and debris. With a wide range of colours to choose from and a 5 year workmanship warranty we are your best choice for a maintenance free eavestrough. Aluminum soffits are the best choice when looking for a clean maintenance free soffit to replace your existing wood soffit. Not only is it maintenance free but it will allow for improved attic ventilation if the the existing wood is removed as opposed to installing new soffits over top of existing wood. 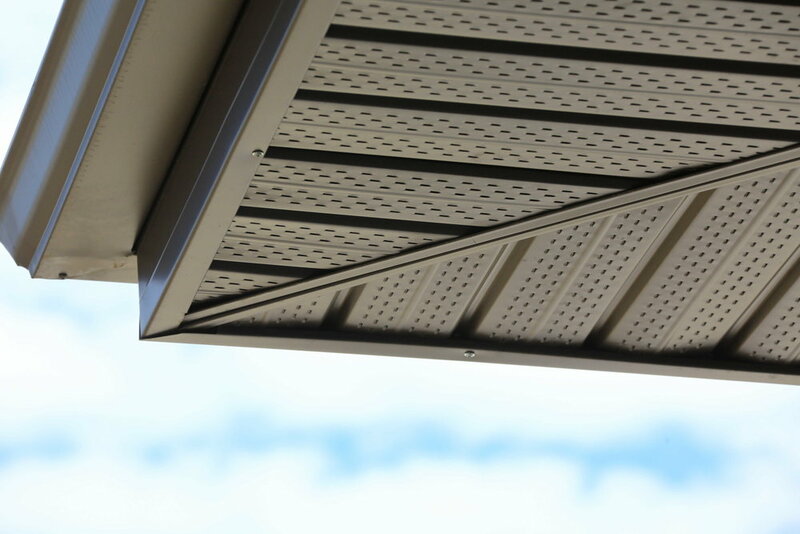 The perforated aluminum soffit allows fresh air to flow through your attic and out of your roof vents, prolonging the life of your shingles and also preventing condensation build up from occurring. Eave and gable fascia is the "face" of your roof line. Often overlooked, aluminium fascia is both maintenance free and visually appealing vs traditional wood which will rot over time. Chateau Roofing & Siding also offers aluminium cladding for wood windows and doors. Offered in the same painted aluminium colours as Soffits and Fascia to match your current trims this will both offer a great look and will protect them from the harsh elements.